Jeannie Gaffigan is an American actress, writer, and producer. She is best known as the wife of American comedian, Jim Gaffigan, and co-producer of The Jim Gaffigan Show. Just like Jeannie, Jim is also an actor, writer, and producer. In addition to The Jim Gaffigan Show, Jeannie is credited with a number of works which include the comic animated series, Pale Force; the American television sitcom, My Boys and Jim Gaffigan: Cinco (2017). She wrote and directed a short video which was released in June 2018. Jeannie Gaffigan was born on March 9, 1970, as Jeanne Louise Noth in Milwaukee, Wisconsin, U.S.A. She is the eldest of nine children born to a Milwaukee Journal film and theater critic. Of her eight siblings, only two have their identity available to the media – Paul and Patrick Noth. Jeannie co-produced Pale Force with the two who both have careers in the entertainment industry as cartoonist and comedy writer respectively. Jeannie Gaffigan completed her education at the Marquette University in 1992. She soon after started a career in theater as a stage actress in her locality. She later left for New York to find better opportunities. On getting to New York, she initially landed small jobs in amateur comedy troupes and small-scale theater companies. The exposure, however, trained Jeannie who would later become a producer as the groups/theaters she worked with usually made original productions. Jeannie later created “Shakespeare on the Playground”, a non-profit theater company that focused on making stage productions of Shakespearean plays in full. She used the medium to teach community youths how to read and write as well as produce plays. She subsequently started writing and producing her own comedy skits alongside her boyfriend, James Christopher “Jim” Gaffigan who would later become her husband. The duo later married on 26th July 2003. The couple gradually developed their writing and production skills, turning it into something significant – comedy specials. So far, Jeannie and Jim have co-written and co-produced five comedy specials with the former directing the fifth special. Their career continued to grow until 2013 when they produced the TV Land television program, The Jim Gaffigan Show. It was a really trying time for Jeannie Gaffigan and her family when in April 2017 she was diagnosed with a brain tumor called papilloma of the choroid plexus. Although she had earlier noticed some strange symptoms like headaches and dizziness, she dismissed them for stress considering her very busy life as a mother of five. However, when she mentioned the issue, particularly a newly developed and scarier symptom of hearing impairment during a routine appointment with her kids’ pediatrician, the doctor recommended diagnoses which revealed her problem. Fortunately for her, the growing tumor was still in its benign stage and she successfully underwent a craniotomy on April 18 of the same year at the Mount Sinai Health System in New York City. The recovery process was, however, a very long and daunting one as some of the surgery aftermath included Jeannie’s inability to walk, as well as having to consume only liquids through a feeding tube. Some complications also arose from the surgery including paralysis of one of her vocal cords. Owing to this, Jeannie has to live with a speech and swallow therapy, with her voice dwindling as the day progresses, and vanishing later in the day. All the same, everyone is grateful she is alive. 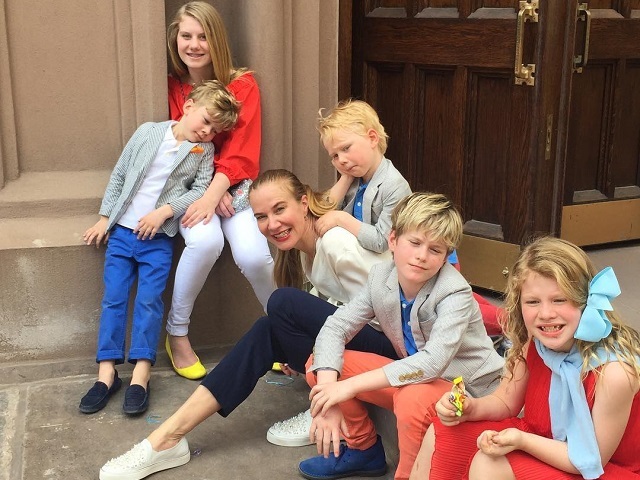 Jeannie Gaffigan has five children, namely: Marre, Katie Louise, Jack, Michael, and Patrick Gaffigan. First child and daughter, Marre Gaffigan was born in 2005. A son Jack Gaffigan soon followed the next year, 2006. Another daughter, Katie Louise Gaffigan arrived three years later on May 10, 2009. After her came two other sons, Michael and Patrick Gaffigan born in 2011 and 2012 respectively. All the kids appeared on the Jim Gaffigan: Cinco show in 2017 with Jack portraying a young version of their dad, Jim. The family of seven all live together in Manhattan, New York, United States. 1. Jeannie and her husband once made the headlines for managing to live in a two-bedroom apartment in New York City with their five kids. They only moved to a larger apartment in 2015. 2. Jeannie is a super busy mum. That was exactly why she took her tumour symptoms as the characteristics of the daily life of a stressed mother. But in August 2016, she together with her husband, took a break from their show in order to have more time to spend with their family. 3. Jeannie played a version of the Newlywed Game in July 2015 on the NPR program Ask Me Another, and guess what? She gave the correct answer to all the questions! 4. Starting from 8th April 2016, Mrs. Gaffigan, alongside her husband and three children featured on a marketing campaign for the 2017 Chrysler Pacific. 5. Jeannie is a one-time Emmy Awards nominee for Pale Force. She is also a winner of a Christopher Award for The Jim Gaffigan Show: My Friend the Priest. Her outstanding television and media achievements also earned her Fordham University’s Eloquentia Perfecta award. 6. Alongside her husband, Jeannie delivered the commencement address at the Catholic University of America in May 2016. The couple also did same at Marquette University in May 2018. 7. Just like her husband, Jeannie is a devoted Catholic. But owing to her higher level of devotion to the religion, her husband had once called her a “Shiite Catholic”. She worships with her family at the Basilica of St. Patrick’s Old Cathedral in Manhattan, NY.